When it comes to monetizing your blog using contextual ad networks, there are very few high-quality publishers out there. However, the higher the quality of the ad network, the harder it is to get approval. We have seen the same for AdSense approval & BuySellAds Approval. 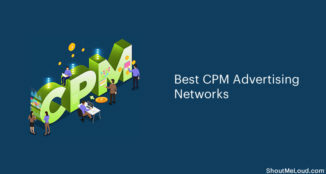 Last time, when I wrote a detailed review of Media.net, many users talked about not getting approval for the Media.net ad network. Most of the applications were rejected & let me tell you, rejection is always disappointing. Well, it would be wrong to blame bloggers or even Media.net for rejection, as Media.net doesn’t limit itself to only judging website content. They look for a lot of factors before accepting or rejecting an application. 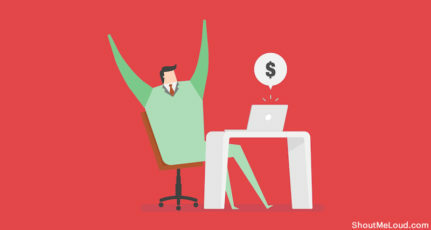 Just in case you don’t know, once you get an approved account with them, you will get a dedicated manager who will help you at every stage to optimize your ad placements & settings for generating high revenue. I’ve never before felt the luxury of having a dedicated manager just for having a publisher’s account on an advertising network. If you have never applied, or your application was rejected, this guide will help you to understand what criteria they use to accept or reject a publisher’s application. If you are confident about your site already, you can skip reading & create an account on Media.net here. Before you apply, be sure that Media.net is right for you. For starters, know that one common complaint most bloggers have with Media.net is low revenue. The primary reason for this is the geo-location of your traffic. We have already talked about why we have low CPC for Asian countries and this ad network follows a similar pattern. 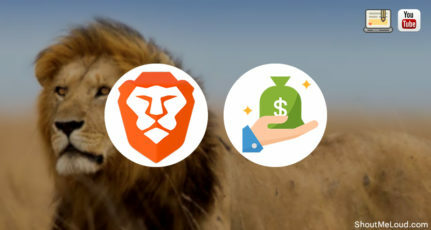 Unlike AdSense, this ad network works wonderfully for those websites which receive a high amount of traffic from countries like the U.S.A & the U.K. However, there is a smart solution for this low CPC traffic & that is backup ads. 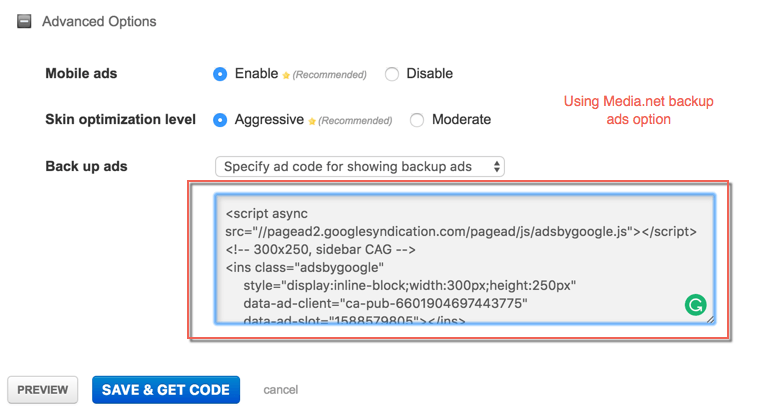 If you have an AdSense account or any other ad network account, you can use that to show backup ads when there is no ad inventory for other countries. If your blog’s primary language is not English, your application will be rejected. This ad network (by Bing & Yahoo!) accepts only those websites which are primarily in English. If you are one of those bloggers who is using dual languages (English + some other language) on your site, I suggest you try applying. Ensure that you keep your blog regularly updated at the time of applying for approval. This is one of their main criteria as they accept only active blogs. If you have a good blog which you are not updating, you can follow the trick of recycling old content to fulfill this requirement. This one is a no-brainer, but I feel it’s important to mention as a good percentage of our readers are newbie bloggers. Don’t use too many ads. In fact, when you have submitted your Media.net application, disable showing any ads for a few days. This is one thing that’s very common among newbie & intermediate bloggers; they don’t take proper care of their sidebar widgets. 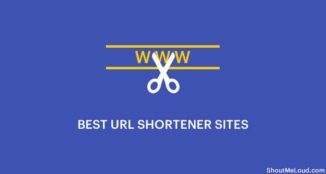 Get rid of any unwanted widgets such as live traffic or any kind of fancy things which don’t add any value to the content. Your blog/website should not indulge in any activity that is listed above. Along with this, you should have quality & valuable content. Ensure that you are not spreading piracy, hacking tools, or any such content which may harm an individual. Follow the usual ethics of blogging & I don’t foresee any problems in getting approval. Overall, Media.net has stricter policies when compared to AdSense. But at the same time, it’s more rewarding in terms of revenue. So it’s at least worth trying. I will keep sharing my insights & understandings about Media.net & similar ad networks in future posts. If you want to stay updated, subscribe to our email newsletter. 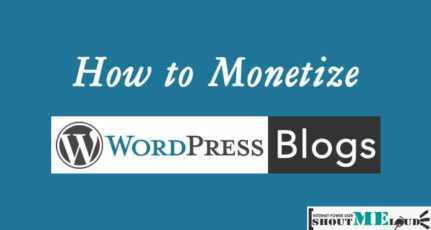 Do you use Media.net to monetize your website? Share your reviews and opinions below in the comments section. Very nice post and firstly i want to say thanks for this great post. Now i want to know if anyone rejected by media.net first time then he can apply second time or not. if he can also apply second time then how many chance he has to apply for Adsense. I am looking forward to hear from you soon. I’m not sure about this part. Never had a chance to do this. Why don’t you try & let us know your finding. Thanks Harsh for this wonderful article. I applied for media.net and got an approval mail exactly after two days. You will get a link to set your media.net password. Using the password and regd log in email, you can simply log in to the system. I submitted My Application The i Saw The Message In Mail, It Will Take 2 Days Or Less. After 1.30 hour I Got Mail From Media.net,What A Lucky,Just Approved In Half and Hour.Also They Send Most Popular Ad Codes With The Mail,I`m Also Still Waiting For Adsense,I submitted My Application Before 7 Days,They Send Me Code To Place Into My Website. I Have Only 19 Articles,Also My Domain Only 37 days old,But I Got Hug Alexa Global Rank 22,89936 In Just 37 Days. Do You Have Any Idea They Will Accept My Application.? Can we place both ads media.net and Google Adsense in same website? Hi Harsh, Is There is any ads Placement Guide for media dot net. How much numbers of ads we can place using media dot net.Please tell me i am only using media on my website. currently i placed only 1 ads unit. You can place up to 3 ads on a single page. You must add 3 ads on every page. So, you will get maximum impressions on the account. Can i apply for Google Adsense with Media.net already on my website ? If one has been rejected earlier, does he stand any chance of getting approved later or if one again applies for medianet approval again? Yes, you can fix everything and reapply after few months. Great post Harsh! My site was rejected by media.net because or non-sensitive content. Could you please give me an idea of what they mean by non-sensitive content? A million thanks in advance! 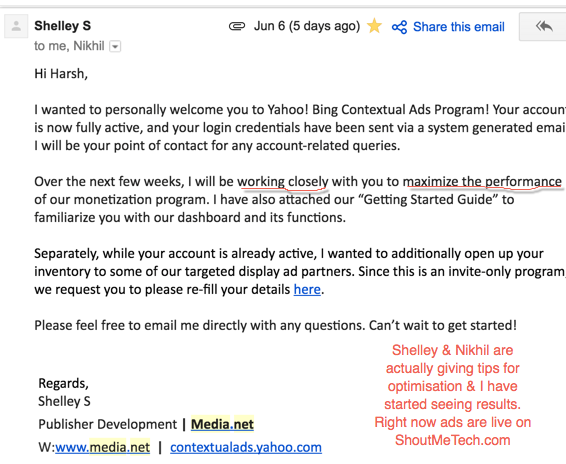 Hello, if you don’t get approved, will Media.net tell you why and where you have gone wrong to improve the website? Very good post Harsh. Should my blog/ website be an old one to get approved by Media.net? Thanks for useful article publish. I have question about Media.net. Getting accepted into media.net is tough. Your traffic must come from USA and UK. Thanks for this tips I”ll try it out. I applied for media.net on my new (first) blog on Saturday while waiting for google adsense to get back to me and it got approved today. With only 280 page views. Most of which are probably mine. It went live about a week ago. It’s nothing unique but it got approved. I am still very excited. Now looking for tutorials on how to place ads.